I enjoyed it-fun. People working were really nice. Short. Still fun to do! A reasonably priced unique experience for a big city. It is well-organized and the staff does a great job of getting people prepped and ready without having to wait much. I recommend going earlier in the day since it is less crowded. That being said, the experience happens so quickly. If I were to do it all over again, I'd go a twice. Once to get a feel for it and get over my nerves. 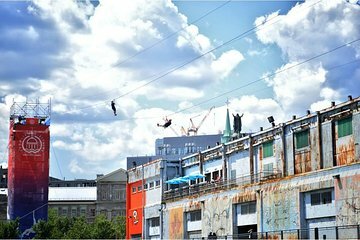 The second to really enjoy the experience of soaring through the air on a beautiful day in a great city. So awesome, what a great experience. Just be aware if buying tickets off Viator, don't hand off your wallet to someone to hold while you're on the ride because you may need your ID to verify you are the same person using the ticket as the person who bought it. The ride is literally 20 seconds long, it goes by really really quick, but its a great adrenaline rush. My hands and body were shaking at the end of it! The view was amazing both climbing up to the top where you launch and during the ride. 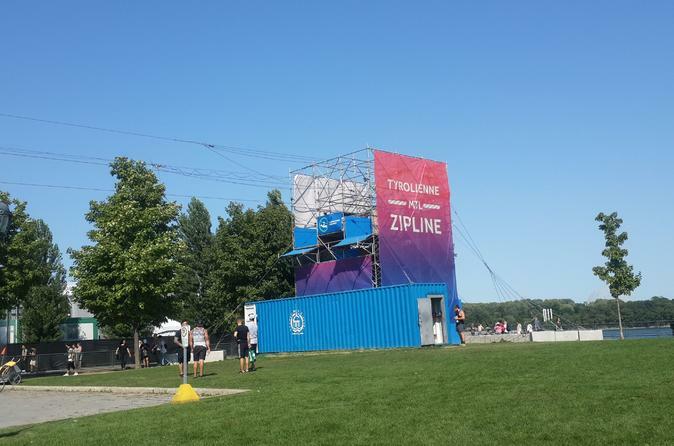 I did this zipline on my last night in Montreal and it was an excellent way to cap off my trip. Highly recommend. It was very cool to soar over Old Port. It went by so fast. It would be great if it was longer or it had a line going back. The view is beautiful! Great Experience. I just wish it was longer!!! Overall, satisfied. The process of getting on the zipline went well and the zipline trip across the water was fun, but I thought customers would get to ride back as well. Although fun, it was too short. Fun Experience and great staff! !